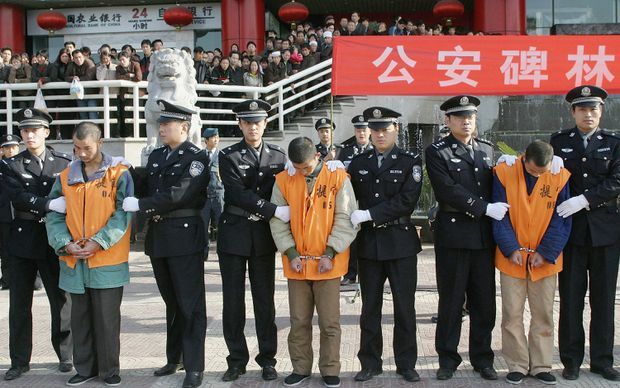 Chinese police parade a group of 15 convicted criminals to be sentenced in public, most of which are likely to face the death penalty, on Nov. 15, 2004 in Xian, China. The crowd gathered by the thousands, jammed into a stadium in southern China to watch capital punishment made into a spectacle. Then the accused appeared, in a parade of trucks as onlookers held up cellphones to record the moment, accompanied by a soundtrack of sirens. The 12 accused were brought onto a stage, where authorities conducted an open-air trial. People stood on their seats to watch; around them hung posters for a campaign against drug crimes. Ten were sentenced to death. It was a vivid display of the way that modern China, believed to be the world’s most prolific state executioner, continues to use the death penalty as a potent political tool, designed to burnish the power of the state by demonstrating its willingness to eliminate the unpopular and the criminal. At least three times in recent years, Chinese authorities have staged mass-sentencing events such as the 2017 episode in Guangdong province, when the 10 who received death sentences were taken away for immediate execution. On Monday, authorities in the north-eastern city of Dalian staged a different, but no less public, performance of justice, inviting foreign and domestic media to witness a judge sentence to death Robert Schellenberg, a Canadian man. The verdict was delivered less than 70 minutes after the conclusion of a single-day retrial in which the chief judge repeatedly asked defence lawyers to keep their statements brief. But the Chinese death sentence, in its speed and severity, was crafted as a blunt statement of the power wielded by the country’s authorities – at a time of tense diplomatic relations with Canada, following the arrest in Vancouver of Huawei executive Meng Wanzhou. As a chief judge stood to deliver the court’s verdict against Mr. Schellenberg Monday, a photographer suddenly appeared with a telephoto lens to capture the moment he learned his fate. Soon after, Chinese state television aired courtroom video of a stoic Mr. Schellenberg as pursed-lip emissaries from the Canadian embassy looked on, powerless. “When it comes to China’s own laws and national interests, the country’s perseverance is unbreakable,” declared the Global Times, a nationalist tabloid run by the Communist Party. But the sentencing of Mr. Schellenberg suggests China is now testing the death penalty as an instrument of foreign policy, a notion dubbed “death threat diplomacy” by Donald Clarke, a professor at George Washington University. Just how many people China sends to death every year is a secret. But researchers believe Chinese executions vastly outnumber those in the rest of the world combined. There is, scholars say, understandable reason for this and – although the executions themselves are done out of public view – occasionally reason to make a show of the process. Execution is often publicly popular and the death penalty in China makes for effective, if dark, politics. “China’s capital-punishment regime has served a distinctly political function for over half a century: to reconfirm the political legitimacy of the party and to strengthen the political power of the state,” wrote Michelle Miao, an expert in the Chinese legal system at the Chinese University of Hong Kong, in a 2013 paper. The Communists who swept into power in China in 1949 did not originally support the death penalty. But its use quickly fell into favour under the rule of Mao Zedong, who employed execution as a way to bolster public confidence in Communist oversight. Justice under Mao included mass “accusation rallies” – one of them drawing a radio audience approaching three million, in addition to 10,000 who gathered to watch live – as well as trials by village layman who issued death sentences without the trouble of legal authorities, and public executions. Death sentences have continued into modern times, in part as a tool to quench “populist thirst for retribution and resistance to reform,” Prof. Miao wrote. Yet in recent years, Chinese courts have curtailed the use of capital punishment. In 2005, China adopted a “kill fewer, kill cautiously” policy – a dramatic change from a much earlier policy of “kill many.” Reforms in 2011 and 2016 eliminated 22 offences punishable by death (46 remain), while courts have issued greater numbers of suspended sentences. As a result, the number of estimated annual executions has fallen from five figures to four. Such changes have won China praise from the human-rights community, as has the reluctance by Chinese leadership to use execution in a sweeping anti-corruption campaign waged under Chinese President Xi Jinping. But the very public sentencing of Mr. Schellenberg suggests China’s leadership remains keenly attuned to the power of death. Chinese authorities and scholars have said they are merely acting to stamp out the scourge of illegal drugs, which, according to state media, have cost the country $106-billion in annual economic losses – not to mention the death of 362 police officers in 2016. With Mr. Schellenberg, "the death-penalty decision made by the intermediate court is legal and appropriate, and reflects China’s strength and determination in cracking down and punishing drug crime,” wrote Pei Zhaobin, a law professor at Dalian Maritime University, in a commentary published by one of China’s legislative bodies Tuesday. “China has no tolerance for drug-related crime,” foreign ministry spokeswoman Hua Chunying said. It is “malicious smearing” to say Mr. Schellenberg’s case has been politicized, she said. Chinese history, however, shows otherwise.